Po.et - The decentralized protocol for content ownership, discovery and monetization of media. "Connecting the Dots" Milestone is live! Come see what's in store for Po.et. The foundation of Po.et is attribution. 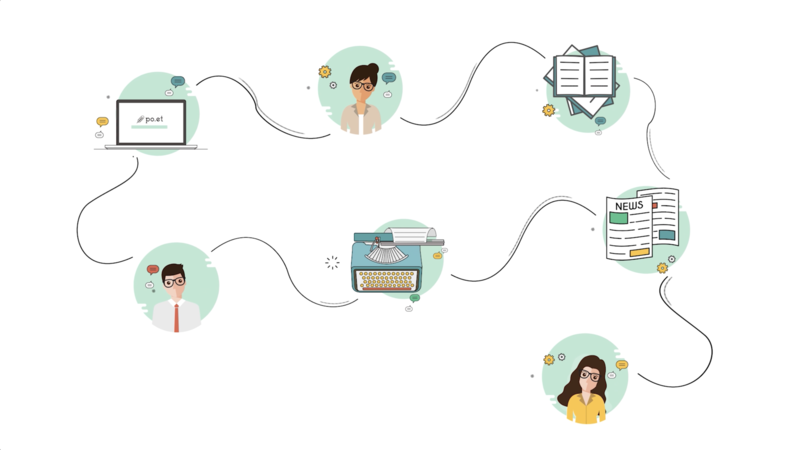 We enable multiple new ways to reference that content through the entire network to help establish validated claims such as ownership or authorship. The Po.et Network builds a set of ubiquitous information based on standard protocols to lower the friction in communicating the value of our content and how it can be unlocked. With the combination of verifiable reputation and on-chain discovery, the Po.et Network expands the options for monetizing content in a safe, controlled way. Both public and private marketplaces can be enabled. Everyone can see the actions taken on the Po.et Network and establish a history of certain behaviors by entities. Each piece of new information helps us be sure of who is safe with which to engage. A Protocol for Creative Works in Web 3.0.